Is it taking you months or years to write? Ever thought of giving up because you feel stuck? Have you lost motivation and abandoned writing your book because the process feels so slow? Do you want to get past what is stopping you from publishing your book? You are not alone. The authors of Write Your Book Now! have helped hundreds of writers overcome these types of problems. Now, they have teamed up to teach you how to write a book, start writing faster than you imagined and more importantly, FINISH STRONG. Whether it is writing fiction or non-fiction, Write Your Book Now! offers tried and tested advice from two top writing coaches. It is time to blast through all the excuses that have kept you from writing a book! Write Your Book Now! offers exactly what you need to go from “Someday I’ll get my book done” to “I plunged in and wrote my book—fast!” Lynda McDaniel and Virginia McCullough understand what too often stands between writers and their published books—busy schedules; lapses in confidence; or creativity-crushing, productivity-blocking concerns about getting every sentence perfect the first time. Using their Fast-Start/Strong Finish Method, you can say goodbye to all the reasons you haven’t finished and published your book. This A to Z "how to write a book" guide pulls together topics in an-easy-to-use format that delivers practical tips and tools to unleash your creativity, write past doubt, and even create time in your already hectic days and weeks. Prepare to be inspired as you rid yourself of nagging issues that have made writing so much more difficult than it needs to be (and might even have stopped you cold). With the top writing instruction in this book, you can finally move forward and write, publish, repeat! 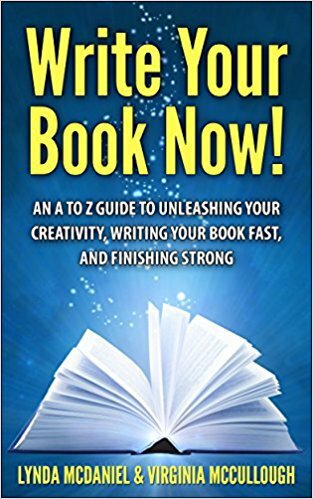 Follow the tips in this book and take the pain out of writing and finishing your book. Stop struggling and start writing! Lynda and Virginia have earned my 5-star rating for their book, “Write Your Book Now”. Not only do they follow their own advice in HOW they have written their book, they gives stories and content that is rich and meaningful. Some of my favorite sections in the book are “G for Goals”, “I for Identity” and “R for Roll-out”. The goals were fresh and creative. In letter “I”, my favorite part was #3--“What do your readers long for?” That question incites deep thinking in writers--thinking that delves into the essence level or Mother Lode of writers’ target markets. In the Roll-out section, Lynda and Virginia gave an example of a client, “Judith”, and her book marketing plan. Rather than forcing Judith to adhere to a rigid structure, they listened carefully to where Judith was in her book process and carefully crafted a plan around that. Doing this allowed Judith to achieve success in creative, fresh ways. As if the tremendous value and insights in each letter of the alphabet (the A-Z) weren't enough, the book includes a generous list of resources and a free Q&A section, giving complimentary consulting worth its weight in gold. I give them the highest rating for a book that is enjoyable, easy to read and chock full of value. "Fast Start:Strong Finish:Be Bold" I like it!!!! I am a published author but I have had trouble getting started on my new project. With the help of "Write Your Book Now" I am now working on my first draft. There are many good tips in this book and I am now focusing on the important points the authors make about story-telling and having joy about the creative process. Practical, usable, valuable advice from a real pro.